Another day to wear shorts and t-shirt. I took it real slow and mopped my floors. I’m quite glad I don’t have more rooms with floors to deal with. I just could not bear those dirty floors another day. You know how that goes. Getting old is not fun. But then everyone has something, don’t they? I just love the way light shines through glass. That’s why I so enjoy the colorful bottles on my kitchen windowsill. I recall when I was a child, someone I knew had lots of kitchen windows all lined up along one wall. And she had bottles of what I assume was water with blue dye in all of them. I remember staring at them and being in awe at how pretty it was. I think perhaps that was my first inkling that a home could not only be usable and have in it what was necessary for everyday life, but it also could be pretty and decorative. Life is full of ups and downs. And finding the beauty, the joy of simple pleasures, just makes life somehow easier. It can be gathered utensils in a crock. 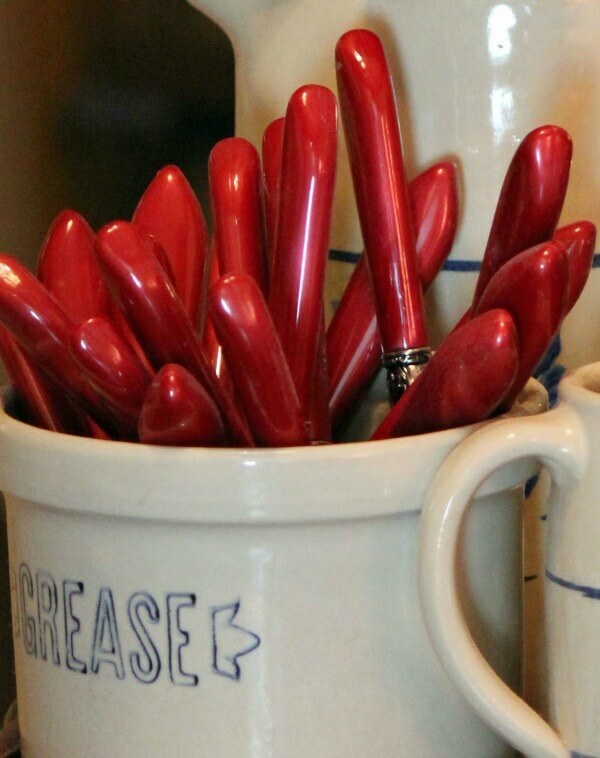 Or whimsical salt and pepper shakers displayed in front of a plain white glass pitcher. I have known people who just hurry through life, too busy to pause and see these wondrous gifts. They are the people who see the proverbial glass as half empty. And those of us who daily experience the joys of simplicity see it as half full. I wasn’t always this way. But once I caught on, and taught myself to notice, I saw beauty everywhere. In all kinds of little nooks and crannies. I saw it in the bird building a nest, a squirrel burying a nut. The way the leaves looked when the wind caught and twisted them just so. It is really such an easy equation. We all experience pain and sorrow. But we need, in the midst of it, to remember to stick our heads out the window to feel the sunlight on our face. The warm caress of it on our skin. Like Mother Nature softly kissing you. So today I wish you a multitude of simple joys. Any of the little but important things that put a smile on your face. I love all your pretty dishes lined up on the shelve – the colorful bottles with the sun shining through – so very pretty and you are right – very beautiful to sit and look at – glad your ankle cooperated and you were able to get your floors done. I just finished reading M.F.K. Fisher's last book, "Last House." A few chapters were a little pompous, but there were many delightful reminiscences of her life in France and California. But what really struck me were the final chapters, in which she details the insults of aging. Her mind is young, she talks of dancing, but only in her mind, not with her body, which can barely move. How difficult it becomes to type and write, how her eyesight fails, how even her voice begins to fail. How tired she is. Yet, in stillness, she forgets all that and her mind leaps around, still young. She was in her 80s when she wrote it. You have plenty of time! Well said Brenda! Enjoy your day. Love this post, Brenda – Amen. 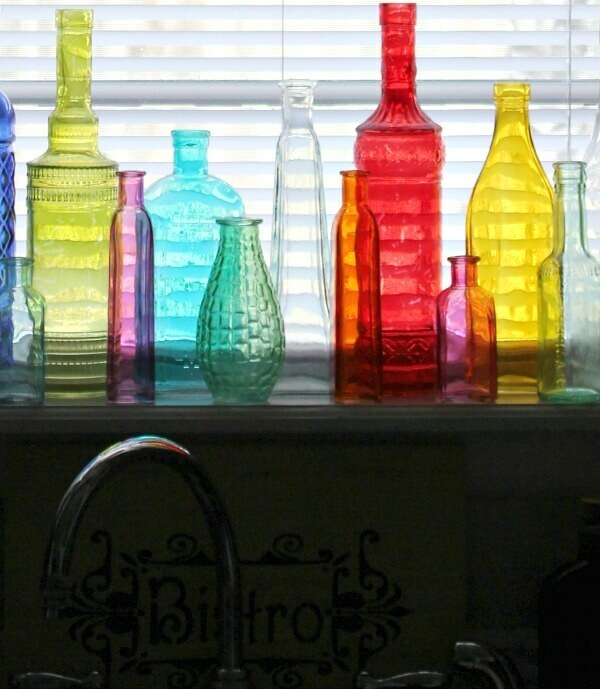 Brenda, I love all of those bottles and your dishes…so gorgeous! I love how the light shines through glass also…absolutely amazing to me! You are so right….there is beauty in everything and especially the small things….a worn book, a plate passed down from a relative, the smell of coffee….all of these are truly simple joys! Love and hugs! 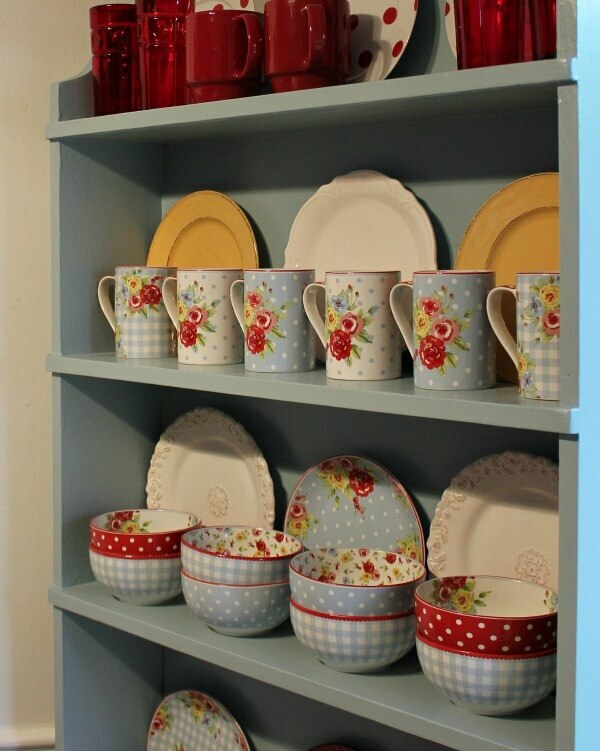 I love the open front cabinet with your dishes so beautifully displayed….. Thank you for sharing …. Simple joys are amazing !!! This is perfectly lovely, Brenda! I wish the same thing for everyone too. I loved your words and your photos. Perfect Brenda! It's the way I want to live my life. Enjoying all the moments, big and small. The simple things like sunshine come through my window. My pottery and the unique shapes and glazes that just fascinate me. I want my home to be my sanctuary! Hugs! I especially enjoyed this post. I am beginning the journey of simplifying my life. I can already see major benefits. Thanks for sharing life through your special lense with your readers. What a lovely post, thank you Brenda for reminding me to enjoy the simple little things in life. Oh I couldn't agree more. There are so many wonderful things to see and appreciate. Childhood memories sure do stick with a person. I remember my grandmother's front porch and have always wanted one but sadly, it never happened. That is such a good reminder! I've lately been hurrying through my days because my plate has been so full but I'm not enjoying it. I need to slow down to see what's right in front of me sometimes! 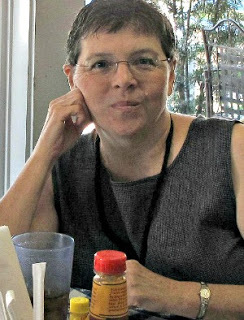 I love your new picture on your blog! When I retired from the hospital in 1997, I began to "stop and smell the roses" and have continued to do so. There is beauty everywhere if we only stop and look. When I am in Florida, I love seeing the sky at night and the moon has it begins to rise. One feels like they could reach up and touch them. So glad you were able to wash your floor – I know that feeling. Your house is always happy and cozy. Thanks for sharing every day! Great minds think alike! My post yesterday was the very same! Love this – happy weekend to you my friend! Ps it's incredibly cold here this weekend I am ready for warm days!!! 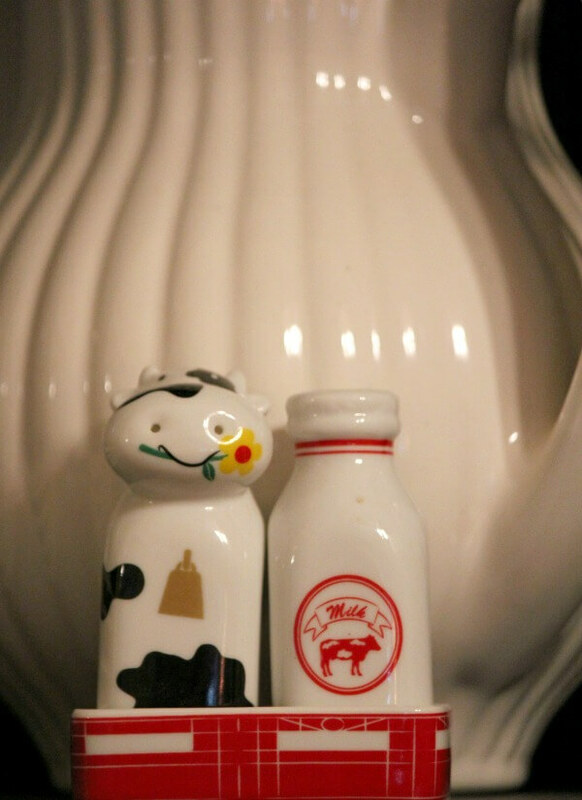 Love,love,love those adorable salt and pepper shakers!!! Then Mom nature rewarded me with a couple of hours of snow squalls. This post had me thinking of one of my favorite books, Understood Betsy, by Dorothy Canfield Fisher. Betsy has to go live with her rural relatives, the Putneys, who are regarded as dreadful by Betsy's city relatives. Betsy is surprised to see a long row of windows lined with bright geraniums in the Putney kitchen. She had never seen such a sunny, colorful display in the stuffy city home where she previously lived. With the Putneys, Betsy slowly learned to find joy in such simple pleasures. You are right…sometimes life gets very hard. But in each day there are blessings; on those bad days you just have to look extra hard to find them. It can be as small as a single flowering "weed" that keeps on doing what it's supposed to do, even in the worst conditions. Or a little bird that sings in the snow. Thank you for reminding us. When I was a girl, vanilla used to be in cute fancy little bottles, with a cute white cap, several which I in fact still have, after all these years..That was back in 1948-1949. Anyway, my brother, who is 6 years older than me, would refill them,when they were empty of the vanilla, with food coloring mixed with a little water. Some were red, one or two blue, and a couple others were green. 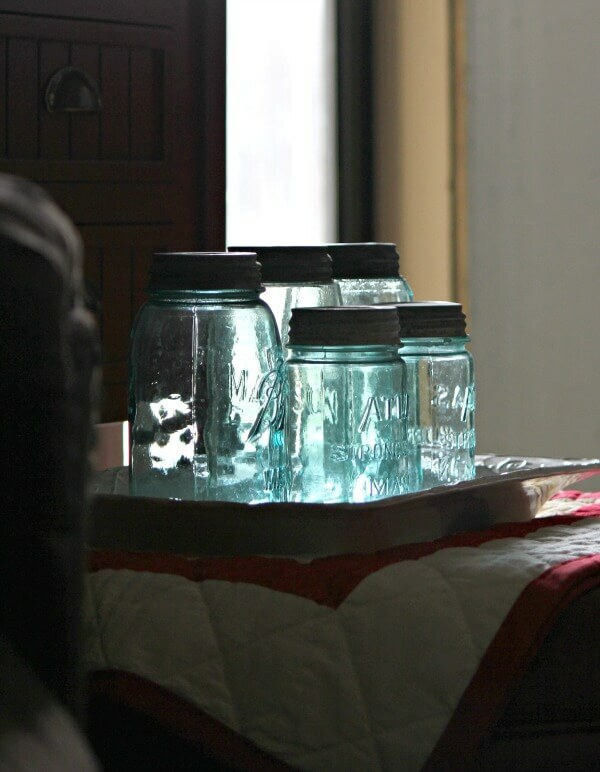 My Mother had them sitting in our one small kitchen window, with the sun shining into them, and reflecting into our kitchen.What fun to hear, that you remember something similar to this. Memories, how sweet they are, from a softer time in our world. the simple small things that feed our souls. for me… the sound and smell of rain. always. and birdsong in the early mornings. and sunlight and shadow on a pure white wall! xo♥ have a wonderful weekend dear bean! Great little reminders! As I am in the throes of recovering from knee surgery and hate being on crutches and being home-bound 24/7, I was feeling pretty down yesterday. Today is a new day and I'm going to try and be positive. Lovely photos, Brenda. You are right about being able to take in the simple, small joys of life. I am endlessly grateful for my eyesight as I am a very visual person who loves looking at beauty–the colors, the shapes, the variety. Our natural world is truly a wondrous creation. Recently, I have been reading to my twin grandsons. who are just six, about the solar system. They are very fascinated with how the planets orbit and how close or far from the sun they are and what the surfaces are like, etc. And I have learned quite a lot that either I never knew or had forgotten about the part of the universe we share with the other planets and the sun. Also, I have developed a new sense of awe at the way it all works and the mystery of how it all came to be. In a way that's not a "little thing" and yet if you are appreciating it in a new way as you might a beautiful flower, it is a small but important addition to your life and your outlook on things. I hope that sentence made sense! And the sun coming through the glass is like that: it adds a new dimension to your life when you feel the joy or wonder of things like that and the natural world. So let's hear it for simple, small and wondrous! It's there for all of us if we remember to look. Beautiful post Brenda….nature softly kissing you…love that!